For all performing venues. The classic monte style trick, scripted in two different ways to allow the trick to be performed at any time in your parlor/stage routines. 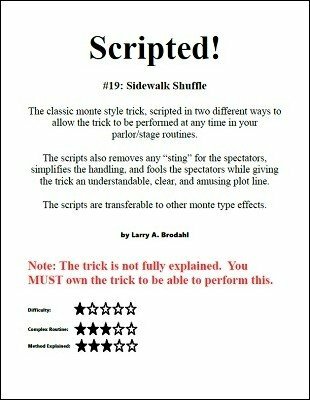 The scripts also removes any "sting" for the spectators, simplifies the handling, and fools the spectators while giving the trick an understandable, clear, and amusing plot line. The scripts are transferable to other monte type effects. This ebook gives you every line, joke, piece of timing, setup and nuance of the routine. The ebook also takes you through the an overview of some of the steps of script writing and routine design used to create the script.